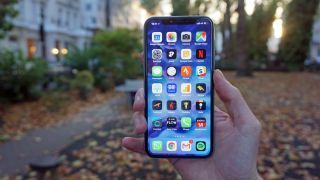 Well, this isn't good - after squashing a few software bugs, admitting that performance isn't great in cold weather, and warning users that some burn-in is to be expected on the new iPhone X, the latest issue Apple has to deal with is a bright green line appearing down the side of some users' handsets. All par for the course for a company launching a premium smartphone these days it would seem - the Pixel 2 and Pixel 2 XL have had their fair share of problems too - but at least this particular issue seems to be limited in terms of the number of people affected. 9to5Mac reports that complaints about the mysterious green line first surfaced last weekend and there are currently a total of 35 people (and rising) who've logged the issue with Apple - not a huge number in terms of the millions of handsets Apple is shifting, but it's not what you want from your brand new flagship phone. Looking at the photos posted to Twitter, this does seem like a genuine issue, albeit one that most users haven't come across. Right now Apple hasn't offered any solutions for a fix, bar sending your new iPhone X back for a replacement. For many months now rumors have been swirling that Apple only just got the iPhone X ready in time for the end of 2017, and that the phone will be in short supply for months to come. For its part, Apple has promised that it hasn't cut any production corners in its efforts to get the tenth anniversary iPhone out to the masses. For now this looks like a minor bug on a select number of handsets - bad luck if yours is one of them. If Apple acknowledges the issue, or we see more reports of the dreaded green line, we'll let you know here.